Rock N' Rollers for GCHS! Come and rock out for the shelter animals Saturday, Feb. 23, at Chicago Boys for a day of some great music during the Rockin' 4 Paws fundraiser! Enjoy the sounds of acoustic rock in the early afternoon! Kicking off the festivities will be local duo talent, ZEN, who will put on a high-energy and entertaining show! The ZEN pair will make sure to keep the momentum going with a great collection of songs and moves to keep everyone involved. After ZEN, take in a cold beer or two and some of Chicago Boys' tasty menu items, buy some raffle tickets to win some amazing prizes from all local businesses and check out music and pet-centric vendors in the parking lot. 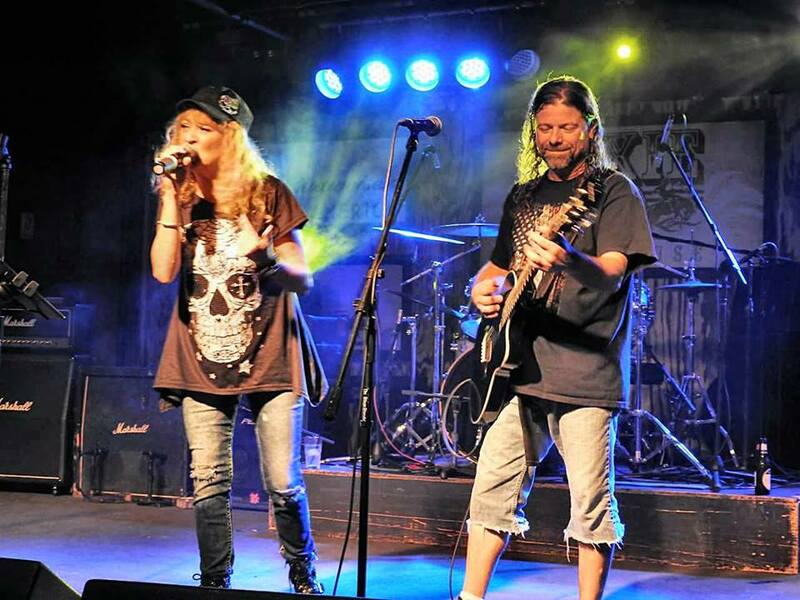 After ZEN has you wanting more, get ready for a heavy metal blast from Southwest Florida's newest rock band Dead Ritual, followed by Rockin' 4 Paws' headliner, Germany's best Metallica Tribute band, Metal Militia. These will be full stage performances, with one newcomer to the SWFL rock scene in Dead Ritual, the other heavy metal vets, IN Metal Militia, who will put an exclamation point on the event with plenty of recognizable Metallica tunes to send you home more than satisfied! Make your mark in a GCHS shelter animal's life by donating and win one of the great raffle prizes which will be available. Best of all, the shows are FREE, with a suggested donation of pet food/supply donations! Click here for GCHS' wishlist. Come and take in an afternoon of awesome Rock N' Roll music at Chicago Boys, and know you are aiding in a GCHS shelter animals' hope of finding their furever home! All the way from the Land of Deutschland, comes one of the top Metallica Tribute Bands in the form of Metal Militia! ​Metallica is a favorite around the world, and Germany's Metal Militia captures all that is the popular thrash metal band has incorporated in their music for 30 years strong! 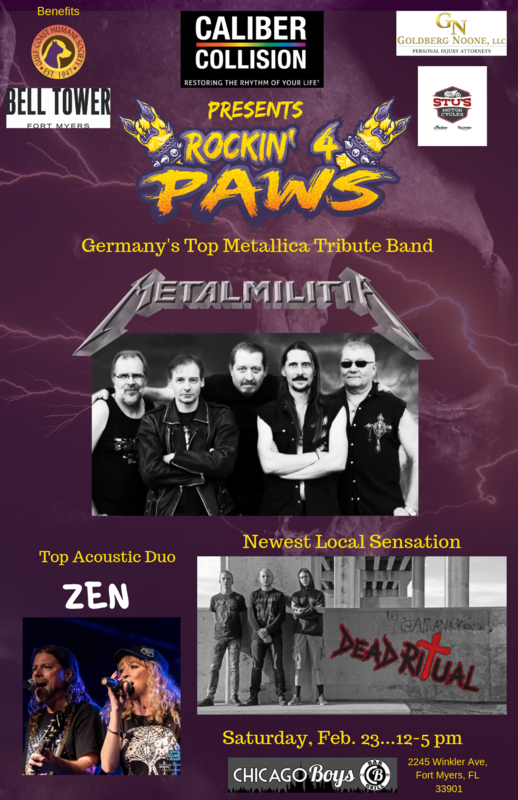 The first-ever Rockin' 4 Paws headliner, Metal Militia, will play the favorite hits from Metallica such as "Seek and Destroy", "Enter Sandman", "For Whom the Bells Tolls" and "One"...among just a few top songs. Be ready to close out Rockin' 4 Paws on a hard and heavy note...Metallica style!! Dead Ritual is (L to R) Danny Dietz (drummer), Daniel Dornbusch (lead guitarist) and Brody Wierima (bass and lead vocals). Click Dead Ritual photo to listen to their first recorded song, "6 Steps to Death". 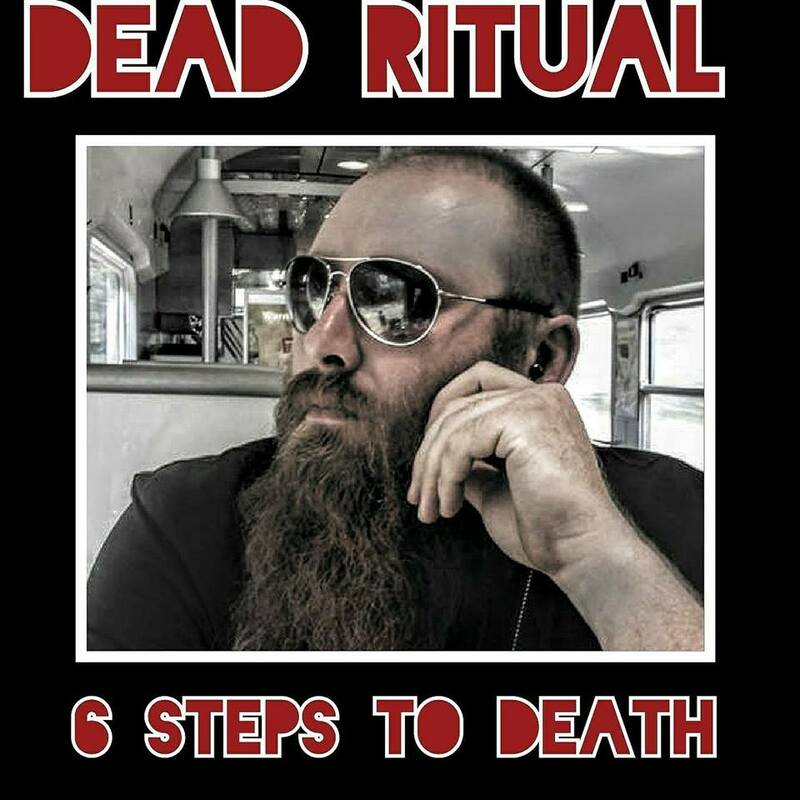 Click the image above to listen to Dead Ritual's first recorded song, "Six Steps to Death." Join the #BeDead Horde on Facebook! Southwest Florida's newest heavy metal band has direct roots in Southwest Florida. Dead Ritual's members have a high ceiling since all are still in high school as juniors at Ida Baker High School in Cape Coral. The band's origins were born in a Cape Coral garage two years ago. 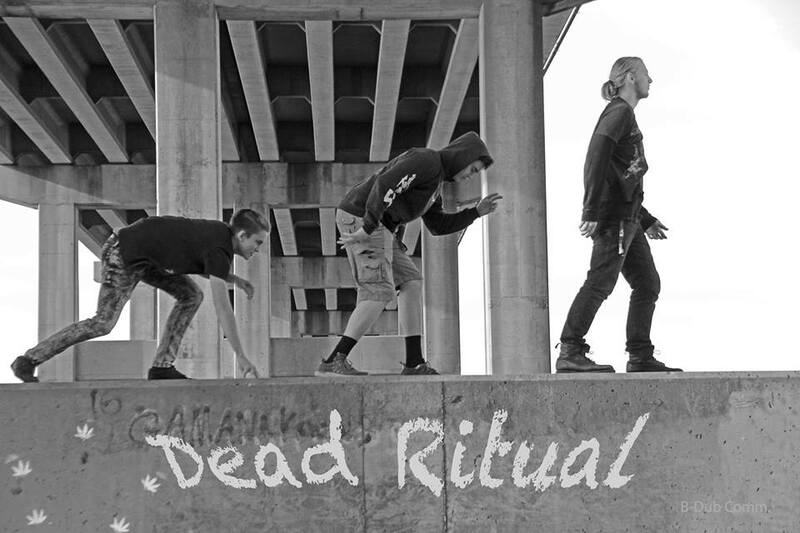 Founding members Brody Wierima and Daniel Dornbusch were at the ripe old age of 15 years old when they decided to follow their musical influences of SlipKnot, Metallica, Megadeth, Anthrax, Bullet For My Valentine and Hatebreed to form Dead Ritual. There have been transitions throughout the two-year process, and Dead Ritual has added new drummer Danny Dietz, while original rhythm guitarist, Max Heinrich, still visits from his home in South Dakota to jam with his old bandmates. Dead Ritual will perform a nice, edgy blend of heavy metal covers. But the three-piece band (Dornbusch on lead guitar, Wierima on bass/lead vocals and Dietz on drums) will unveil two originals. One of those two originals will include their hard-hitting Six Steps to Death, which is a an emotional tribute to Wierima's uncle, Eric Rasmussen (pictured left), who passed away suddenly at the age of 38 in Minnesota. Eric, who was a bass player himself in a heavy metal band, was Brody's true inspiration to picking up a bass and reaching his goal of making it in a rock band. Many hours practicing in their parents' garages, has Dead Ritual ready to make their live debut on the Chicago Boys' stage as the opener to Metal Militia during Rockin' 4 Paws!! The Rockin' 4 Paws crowd will be seeing an emerging heavy metal band in Dead Ritual...one in which has the ambition to keep climbing and clawing to being bigger and badder than ever! ZEN is (L to R) Christine and Brian Gunder. ZEN will be taking the R4P's stage at approximately 1 p.m. at Chicago Boys. The talented and high-energy couple will perform many recognizable hits, with a fantastic "ZEN" twist to it! 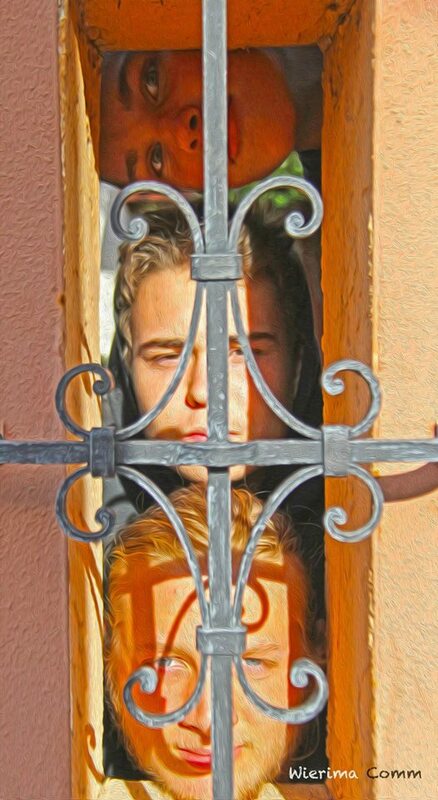 The duo - compromised of husband-wife duo of Brian and Christine Gunder - love their music and they share that passion with the audience! This local duo will surely keep the R4P's audience alive and happy with their entertaining acoustic set! CHECK OUT ZEN'S VIDEO HERE! Interested in sponsoring or donating in-kind for raffle prizes? VENDORS are needed, as well!! Set up a tent and table with your marketing materials in the spacious Chicago Boys' parking lot, all for a vendor fee of $50! 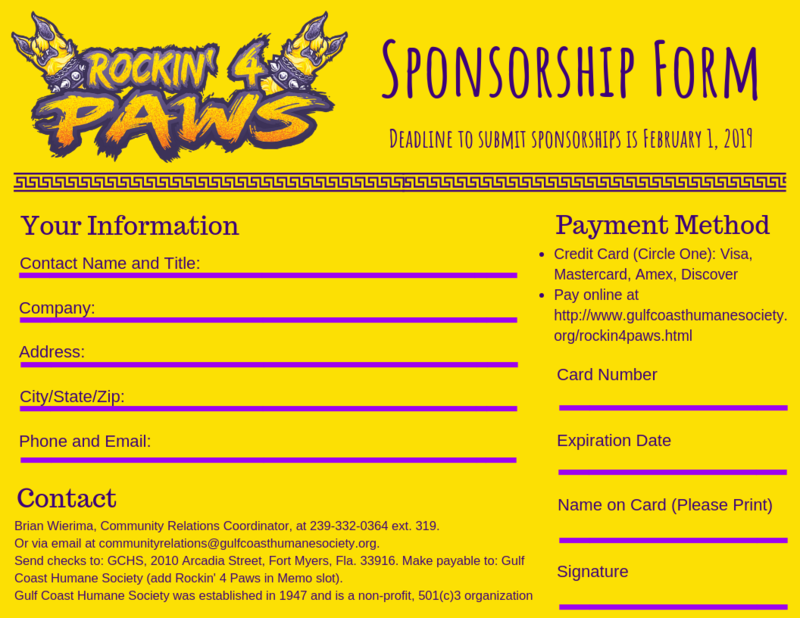 Contact Brian Wierima, Community Relations Coordinator, via email or by calling 239-332-0364, Ext. 319. 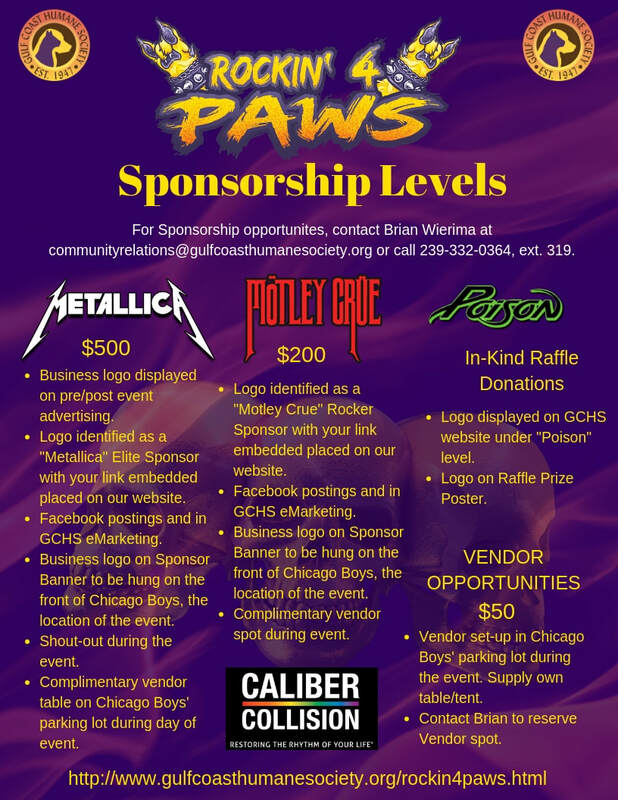 Members of Dead Ritual thank Caliber Collision for being the Premier Sponsor for Rockin' 4 Paws event, which benefits GCHS. Caliber Collision bio: Caliber Collision didn’t become the world’s largest collision repair company by accident. It has taken an unyielding commitment to be the collision repair provider of choice in every community we serve as we deliver on our purpose to Restore The Rhythm Of Lives. Headquartered in Lewisville, Texas, Caliber currently operates 620+ locations across 18 states, and employs more than 12,400 teammates serving more than 850,000 customers per year. Caliber invests in teammates through proprietary personal and professional training courses, and at Caliber, continuous advancement opportunities are offered from within the company. Caliber Collision is also deeply committed to the communities we serve. Each spring, Caliber Collision actively runs the Rhythm Restoration Food Drive within its 620+ centers, which then supplies 50 food banks across the U.S. with more than 3 million meals for children in need of nutritious meals over the summer break. Caliber has also gifted nearly 200 fully-refurbished vehicles to families in-need of reliable transportation through the Caliber Recycled Rides program over the past five years. Caliber is currently recruiting and training active military personnel for careers in the collision repair industry through the Changing Lanes program, which is currently running at Ft. Bragg in Fayetteville, NC and Ft. Hood in Killeen, TX. In short, Caliber is deeply committed to our customers, our teammates, and our communities as we strive to become the collision repair provider of choice across the hundreds of communities we serve. Members of Dead Ritual visit Rockin' 4 Paws Metallica Sponsor Goldberg Noone, LLC in Downtown Fort Myers.